The Angriest: Outlander: "The Devil's Mark"
It is 18 April 2015, and time for another episode of Outlander. Clare (Catriona Balfe) has hit every time traveller's worst nightmare: being arrested for witchcraft. 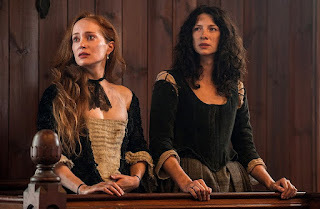 Captured along with apothecary and suspected witch Geillis (Lotte Verbeek), she is interred in a gated pit until her trial can be assembled - a trial that will almost certainly end with being burned to death at the stake. Geillis hopes that Dougal (Graham McTavish) and Jamie (Sam Heughan) will save them. Clare knows that both men have been banished from Castle Leoch. There is something inevitable about "The Devil's Mark". If you are going to throw a woman back in time from the 1940s to the 1740s, sooner or later the witch trial chapter is going to come along. It is simply too easy to include, and comes ready-to-wear with high drama and desperate situations. It is also, sadly, a handy excuse for the series to dive once again into it's raison d'être: violence towards women. So both women are threatened with violence throughout the episode, and there's a basic level of pushing and shoving. Clare gets partially stripped of her clothing and whipped. Geillis, knowing that only one of them can possibly survive the trail (one will have to admit to enchanting the other), throws herself into an act, tearing off her own clothes and grand-standing in front of the baying crowds. It feels ugly. It feels an awful lot like Game of Thrones, which has historically also confused depicting something to show it is a dangerous and horrific world and depicting something for shock value and audience figures. Geillis' sacrifice also involves pointing to her smallpox vaccination scar and declaring it to be the devil's mark. As suspected, she is not indigenous to 18th century Scotland at all. Like Clare she is a time traveller, and the open-ended manner in which this is revealed suggests that we may not have seen the last of Geillis Duncan. How she survives being dragged by an angry mob to the stake I could not say, but something about her exit suggests she will be back. With the unpleasant part of the episode out of the way, it partly redeems itself by finally forcing Clare to confess her time-travelling origins to Jamie. He takes it surprisingly well; arguably a little too well, but it does sufficiently motivate him to return her to the stone circle where she first arrived in the past. He leaves her to return home, but whatever force worked in episode 1 does not work any more. It's an interesting creative choice. It effectively traps Clare in the past on an indefinite basis, and pushes her character to find fresh motivations. Good parts, then, but not a great episode. It's the third sub-standard outing out of 11 so far, bringing the quality ratio down a little to 73 per cent.